The 100-mile plus route from North Down to Donegal passes close to many sites of historical interest. With a 2 p.m. rendezvous deadline in mind it was not possible to make many diversions along the way. However one roadside site was examined briefly. The carved stones at Killadeas, Co Fermanagh (H206540) are interesting and enigmatic. The best known stone is the Bishop's Stone. This 1m high stone is almost rectangular but with one curved corner. On the broad south face is a low-relief carving of a cleric carrying a bell and a crozier. The style of carving is similar to that on some of the Co Kildare High Crosses (Castledermott and Moone). The head is pointed with a pointed chin or beard and the figure seems to be wearing pointed slippers. At the top of the narrower west face of the stone is a high-relief carving of a human head which is similar in style to the carvings found on White Island. Below this is a panel of interlacing. A short distance away is a large slab, about 1.5m high, with many deep cup-marks on one side. On the other side is a high-relief cross within a circle on a bifurcating stem. Close to it is a small round pillar stone and a large round perforated stone half-buried in the ground. The 2 p.m. rendezvous at Donegal Castle (G930786) was made with 30 minutes to spare. The earliest castle was a rectangular four-storey tower-house which may have been built in the early 16th century. It was burned in 1589 and partly demolished in 1595. 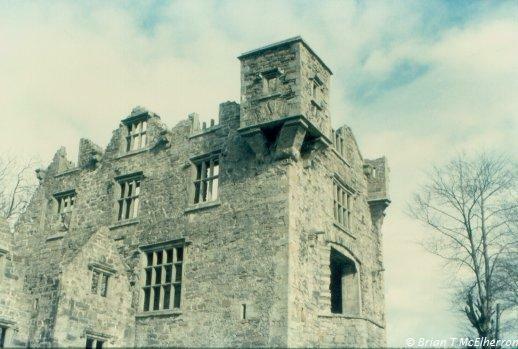 The ruin was granted to Captain Basil Brooke in 1611 who rebuilt the castle with large mullioned windows and attached a three-storey manor house on the SW. Both the old and the new buildings had gabled dormers in the attic storey. The castle stands at the N corner of a polygonal bawn. The manor house has a very fine decorated doorway at the first floor and within the tower-house is a magnificent carved fireplace. This features the coats-of-arms of the Brooke Family and of Leicester, the wife of Basil Brooke. There are many other motifs including tasselated garlands, strapwork and human masks. The ruined tower-house has now been re-roofed. The large window in the first floor bow projection in the SE gable has been completely rebuilt with fine mullions and the square bartizans at roof level in this gable have also been restored. The castle is closed to visitors at present due to ongoing conservation and restoration work. The manor house is being re-roofed. With another deadline in mind (5.30 p.m. at Killybegs) some limited exploration of the countryside was made. Not all our efforts were successful. The cross-inscribed stones at Aighan (G752776) were not located. We were more successful in the search for the court tomb at Binroe (G723754) although what we found could hardly be described as the highlight of the day. In the middle of a thicket, and masked by field clearance, a number of large stones could be seen. Four of these form part of a court, about 5m diameter. Two jamb-stones lead to a gallery, about 5m long, which is divided into two chambers by a second pair of jamb-stones. The side of each of the chambers is represented by single stones and there is a good backstone. The structure is incorporated into a cairn about 20m long and some stones near the rear of the cairn may be part of the kerb. The wedge tomb at Largynegreana (G101774) was easier to find and inspect. Like most wedge tombs this is quite a simple structure. It is about 4.5m long and narrows from about 1.5m wide at the front to less than 1m wide at the back. The portico at the W end is separated from the burial chamber by a septal stone. The chamber has four stones on each side and there is a single large capstone. It is covered with sod and partly buried. A single stone from the outer wall stands about 1m from the rear of the gallery. The court tomb at Drumanoo (G698739) was inspected. It is situated on the high ground to the south of Killybegs, overlooking the harbour. There is a very fine view of the lighthouse at Rotten Island. Little remains of the tomb to indicate its original form. There is no trace of the court. Seven stones form a large chamber, about 4m long, with a well-defined portal. An eighth stone lies just outside the chamber. The side stones project just beyond the end of the chamber. The monument is greatly overgrown. The town of Killybegs is a notable port and fish processing centre. It has a very fine block of coastguard houses built in 1866. It is a six-bay, two-storey block with a tower and machicolated upper windows at the W end. A short distance closer to the town are the Murray Male (1850) and the Murray Female (1861) National Schools, a group of gabled buildings with label mouldings, mullioned windows and a bell-cote. The country to the west of Killybegs is rich in megalithic tombs and we set out to investigate some of the more accessible examples. However the first sites of archaeological interest encountered were two promontary forts at Rinn Point. Only one of these, Largysillagh (G669755) is marked on the map. About 500m to the E of this, just at Rinn Point itself, is the second unmarked fort. The bank and ditch forming the defences can be clearly seen. The forts were observed, at some distance, from the viewpoint on the main road. Two large court tombs were explored to the north of Shalwy Point. The first, in Croaghbeg (G645751) is set in a cairn 36m long by 16m wide. At the NW end is a full court about 10m diameter which leads to a N-S two-chambered burial gallery. The first impression is one of size. The gallery is of massive construction. A huge lintel spans the entrance to the chambers and there are many large corbelled roofing stones still in place. The chambers are divided by well-defined jambs and sillstones. When complete the height of the roof have exceeded 2m. This reinforces the belief by many scholars that court tombs were meant to be entered after completion and were not merely depositories for bones. The court, at either side of the entrance, is built of large blocks laid on two courses. At the NW beside the entrance to the court is a single subsidiary chamber. About 200m NE, in Shalwy (G646752), is the second large court tomb. The coffin-shaped cairn is about 40m long. 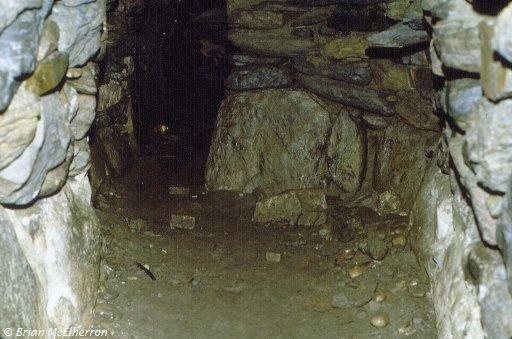 There is an oval court but without a subsidiary burial chamber as found at Croaghbeg. The burial gallery is about 6m long and is divided into two chambers by jambs and a lintel. The entrance to the gallery is surmounted by a lintel consisting of two great superimposed stones, the top stone being gable-shaped. The back chamber is roofed by a large slab resting on several tiers of corbels. The townland of Malin More contains a number of very fine megalithic tombs. We first encountered one of the smaller ones (G525822). At the W end is a gabled backstone and a chamber about 2m long by 1.5m wide. A pair of jamb stones separate this from the middle chamber which is about 3m long. A single jamb stone leads to the outer chamber which is almost completely hidden by the remains of a small stone hut. This hut and several large displaced slabs may conceal further structures such as the court. About 1km from this site is Cloghanmore (G518826) a large full-court tomb. It is set in a coffin-shaped cairn about 40m long. At the Wend of the court, which is about 14m long by 11m wide, are two parallel galleries each divided into two chambers by jamb stones. The S gallery has a fine lintel at the entrance and some large corbels in the roof. Each gallery is about 5m long. At the E end of the court is an entrance passage about 3m long and 2m wide. Single subsidiary chambers open into the court on either side of the entrance passage. About 500m north of Cloghanmore is Cloghacorra (G518829), a much-ruined portal tomb. A single portal stone, about 2m high, stands at the E end and, at the S, is a single side stone, about 3m long by 1m high. There are several other large slabs, each about 3m long maximum, which may be part of the tomb. However the whole collection is greatly confused and it is not possible to determine the original form of the tomb. Close to the tomb is a large standing stone beside a low cairn. The stone is about 2m high by 75cm wide and 40cm thick. To the south of Malin More village is a group of six portal tombs (G502825). They form a line about 90m long with two large tombs at the east and west ends and four smaller tombs in between. The most westerly tomb is the best preserved. The portal stones are about 2.5m high although the N portal stone is broken. Two capstones are visible but the front one is displaced. There is a gabled backstone. A stone about 2.5m high stands just outside the S portal. This feature is found at some other portal tombs e.g. Ticloy, Co Antrim and Tirnony, Co Derry. Such features suggest that portal tombs may be derived from court tombs, although excavation does not provide further evidence of a court associated with a portal tomb. The most easterly tomb is greatly confused. The back stone, a side stone and a large capstone can be easily seen but the portals appear to be hidden beneath the capstone and other displaced stones. The portal stones would be about 2.5m high when erect. The tomb is encroached on by field boundaries. The stones of the smaller tombs are greatly deranged but portal stones, capstones and back stones can be found. About 100m W of the group is a standing stone more than 1m high. It is triangular in plan at the base, about 50cm by 50cm by 25cm. It stands at the edge of a low circular cairn about 3m diameter. Glencolmcille is famous for the turas or penitential pilgrimages that are made round the various stations on June 9, the saint's day. The pilgrimage starts at midnight and has to be completed before sunrise. The stations are marked by small cairns or by cross-inscribed pillar stones which are associated with the early monastery. There is a very fine cross-inscribed stone in the graveyard of Glencomcille Church of Ireland. It is broken in two but would have stood about 2m high when whole. There is another such stone set in a small cairn to the west of the church. Just beside the church, in Straid townland, is the modern entrance to a souterrain (G532850). This is a subcircular shaft about 2m deep but due to the lack of a, ladder, and absence of foot- and handholds, entry was not attempted at this time. However, from previous exploration, it is known that the shaft leads to a large rectangular chamber about 6m long by 2m wide and 1.5m high. To the E, beyond a Iow creep, is a passage about 6m long and 1.5m high. To the W is another passage about 9m long. A short distance E from the church is a block of houses which may be coastguard or lighthouse keeper's houses. They are similar to a row in Greencastle, Co Down. At the road junction to the E of these is another cross-inscribed stone. About 500m N of the church, in Farranmacbride (G534855), is a very fine centre-court tomb. A farm lane with stone walls runs NW-SE through the middle of the court and many of the court stones in this area are missing. There are two two-chambered galleries running off the court at the SW and NE ends of the court and single subsidiary chambers at the N, E and S corners. There may have been a fourth subsidiary chamber at the W corner but this area has been largely destroyed by the building of a field wall. There is one lintel in place and several displaced lintels in the SW tomb. At the NE tomb there is a displaced lintel and another lintel and a capstone in place. The subsidiary tomb at the E has a capstone in place. There is a great deal of cairn material. The total length of the cairn is about 60m and the court is reckoned to be the largest in Ireland. A short distance from the tomb is another cross-slab (G535853). Another such stone was noted at the roadside in Drumroe (G542850). On the return journey to Killybegs a diversion was made to view the promontory fort at Derrylahan (G595759). This oval fort at Bachelor's Point is about 50m wide. It is cut off from the mainland by a bank about 2m high and a ditch up to 2m deep in places. There is a rocky mound near the western edge and steep cliffs at the Nand S edges. About 500m SE of the fort, in Kilbeg (G598756), is a wedge tomb. Three facade stones, about 1m high, form the western edge of the tomb. The centre stone divides the entrance. There are two side stones at the N and four at the S. The eastern end of the tomb is concealed or destroyed. One roofing stone is still in place and there may be two other displaced stones. Some of the outer wall may be seen at the N edge but the S edge is hidden by a field boundary. Most Irish market houses date from the first half of the 19th century, although there are fine examples of 18th century buildings e.g. Hillsborough and Newtownards. They contained the office where market fees could be paid and, since many of the buildings had an open arcade at the ground floor, some of the market trading could be carried out under cover. Many of the market houses also had the court housed in the upper storey of the building as well as a meeting room for the town council. None of the remaining buildings now house a market although many of them contain large shops and some function as courthouses, town halls or libraries. In most cases the arcades have now been enclosed. 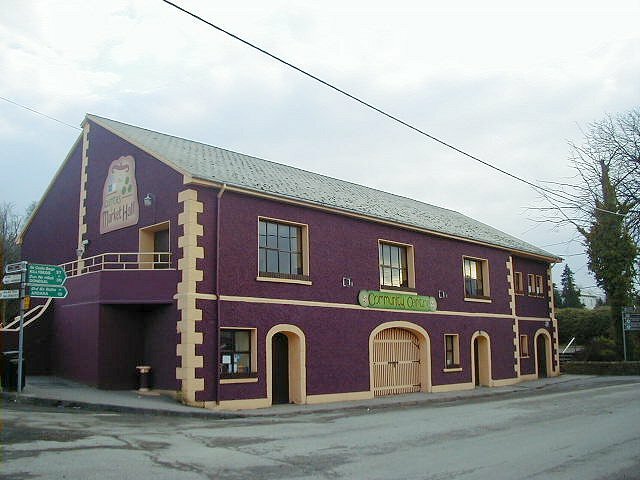 The market house at Ardara is a simple two-storey three-bay building. It has a single large archway below a tripartite window with a gable and clock above. It was built about 1840 and now functions as the local heritage centre. 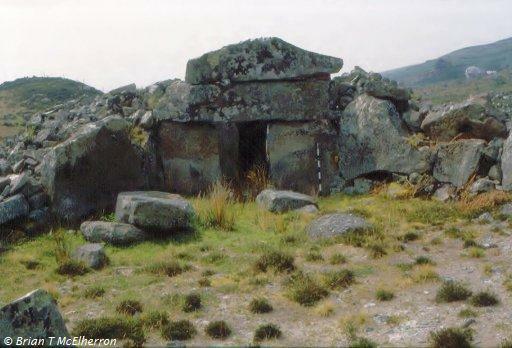 About 6km north of Ardara, in Kilclooney More (G723698), is a magnificent portal tomb. The portal stones are about 1.7m high and between them is a door stone about 50cm high. The sides of the chamber are of single slabs and there is a back stone between them. The roof stone is over 4m long and it rests on the portals and on a small stone on top of the back stone. About 10m away is a much smaller tomb of similar design but with a lintel above the portals. Both tombs lie within the remains of a long cairn. On the other side of the road, about 500m to the west, is a court tomb (G716969). It has a large gallery aligned E-W with two court stones, about 1m high, adjoining at the NE. The gallery is about 6m long and 2.5m wide but is not divided into chambers. The entrance jamb stones and the back stone are about 2m high but the side stones are lower. There are two displaced lintels. One lies across the gallery and the other lies in the court. There are some corbels visible along the southern side. There is a large amount of cairn material. 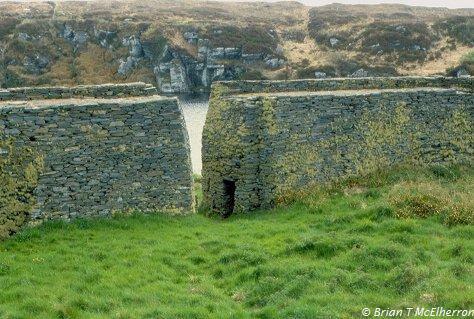 The stone fort on the island in Doon Lough was viewed. It is known as the Bawan, Doon Fort or O'Boyles Fort and is in Drumboghill town land (G700980). Close inspection was not possible because the boats were not yet in the water. Besides this there was a bitingly cold wind blowing and none of us fancied a long cold row across the lough. The fort covers almost the entire surface of the island. There is a tricky approach through the submerged rocks and since these obstructions are just below the surface it is possible that the fort builders knew how to use the rocks as stepping stones. The oval wall encloses an area about 40m by 25m. It is about 5m high on the outside and about 4m wide at the base. The maximum internal height is about 3.5m. The top of the wall has a parapet along the outside edge and may be reached by four short flights of steps. A short section of wall in the NE has collapsed. There are mural passages on either side of the entrance. On the left an opening at ground level gives access to a passage about 8m long rising by a flight of steps to the top of the wall. It is very narrow and a little over 1m high. The passage on the right is entered above ground level. It is about 6m long and lower and narrower than the other passage. At its inner end it turns through a right angle and exits at the internal base of the wall through a Iow creep. The cashel walls are covered with ivy and lichen and the scattered stones inside are mostly hidden by long grass. An exploration of the peninsula north of the Gweebarra Estuary revealed a portal tomb in Toome townland (B791015). It is situated at the Wend of a cairn. The portal stones are about 2m high. Between them is a door stone about 1.3m high. The sides of the chamber are of single stones about 70cm high, each supporting a corbel. There is a gabled back stone less than 1m high. The roof stone is about 1.5m long. At the E end of the cairn is another structure. It is about 5m long. It is a rectangular structure with at least four slabs. In the neighbouring field is a stone about 80cm high by 40cm wide and 20cm thick. On one face is an inscribed cross about 25cm by 25cm. It is greatly worn but there appears to be T-bar terminals to the arms of the cross and triangular terminals to the shaft. Another megalithic structure was inspected near Farragans (B778014). It is a rectangular structure about 2m by 1m. It is divided into two chambers by a large boulder which is firmly imbedded in the ground and does not appear to be a displaced lintel or capstone. The structure is not recorded in the Archaeological Survey of County Donegal. 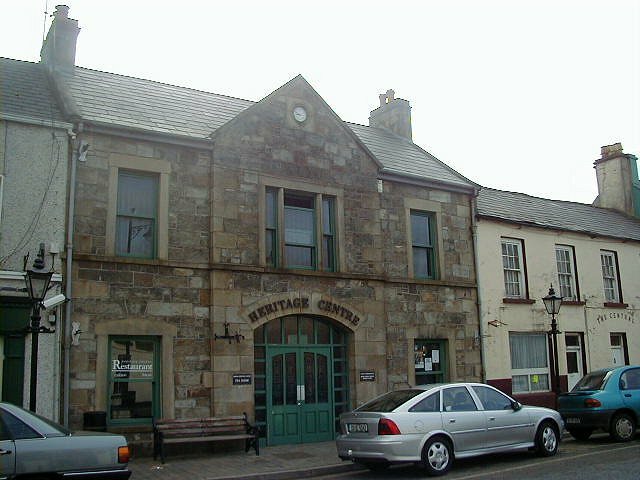 Another market house was viewed in Glenties. It was built about 1840 for the Marquess Conyngham. The original two-storey building had a central archway flanked by doors. A short two-bay extension has .been added on the right. Almost opposite is the court house built in 1842. It is a two-storey five-bay building. The building costs of �700 were contributed by the Board of Works. It was decided to take a more northerly route on the return to North Down. On the road between Killybegs and Donegal Town a small ruined mill was noted. It has a large water-wheel, at least 5m diameter, with wooden buckets, a few of which are still in place. There are indications that it was high breast-shot or pitch-back. Amidst the rubble within the roofless building may be seen at least two sets of millstones and the usual cogwheels and pulleys. The building may also have contained a corn-kiln. However the exact location of the mill was not recorded. Our route took us up the Barnesmore Gap towards Ballybofey and Stranorlar. 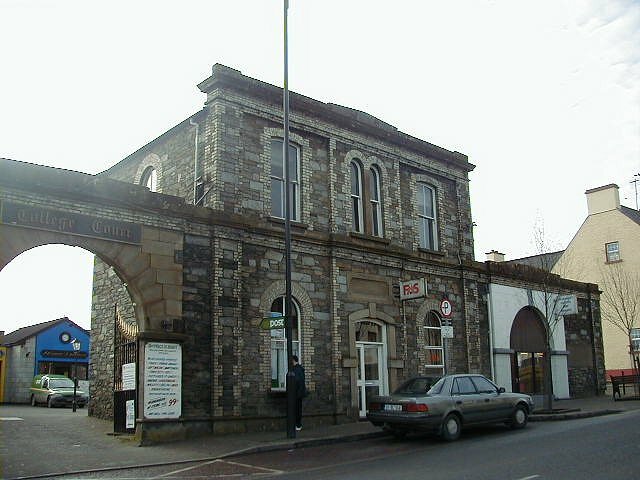 The market house in Ballybofey is a two-storey three-bay stone block with yellow brick trim at the windows. It is flanked by twin archways which lead to the market yard. It was built in 1862. The Church of Ireland cathedral at Raphoe was explored. It has a modern memorial carved door which depicts the four evangelists and other motifs from the Book of Kells. In the vestibule is part of a carved lintel showing the arrest of Christ with St Peter cutting the ear of the High Priest's servant. Just beyond this is the Judge's Seat from when the cathedral housed the court. Some of the earliest building work within the cathedral is shown in a triple sedilia and a piscina basin in the S wall of the chancel. There are other early fragments set in the outer walls of the church. These include another portion of the carved lintel in the N wall, two masks in the S wall of the tower and a hood-mould with two head terminals over a single-light window in the S wall of the chancel. The Bishop's Palace, Raphoe (C259028) was built in 1636 by John Leslie, Bishop of Raphoe 1633-:61. It was taken by Cromwellian soldiers in 1650 and plundered by troops of James II in 1688. It was restored under Bishop Pooley and again in the mid 18th century when large windows were inserted. It is a square four-storey block with four salient-angled bastion-like towers at the corners. It is now four storeys high including the basement. The top storey has brick crenellations and false defensive loops. It was remodelled by the last bishop, William Bisset. The building was burnt shortly after 1835, when the Protestant diocese of Raphoe was united with Deny. The main doorway in the E wall may be an 18th century insertion. The original 17th century doorway may be that which has been rebuilt in the N wall of the basement. The gateway to the demesne is flanked by two octagonal turrets with mock loopholes and crenellated parapets. It may date from Bishop Bisset's time. The gate lodge is a simple one-and-a-half storey Georgian building dating from about 1770. Nearby is the old Royal School which was founded by James I in 1608 and rebuilt in 1737. About 2.5km S of Raphoe, in Tops townland, is Beltany Stone Circle (C255005). This is a large low platform, about 50cm high, defined by a circle of 64 stones. There may have been originally about 80 stones. The diameter of the circle is about 45m. There is a large number of half-buried stones within the circle, some of which may belong to an original cairn. The standing stones are of various sizes and one of them has a large number of small cup-marks on the inner surface. To the SE of the circle is an outlying standing stone about 2m high. Our route now took us through Lifford and Strabane and into Co Tyrone to Newtownstewart. On the hill overlooking the town stands Harry Avery's Castle (H392852). It is named after Henry Aimbreidh O'Neill who died in 1392. The date of construction is not certain. The front of the castle looks like a gatehouse with two D-shaped towers. However this gives access only to the basement. The polygonal courtyard may only be reached by going through the hall at first floor level. The building is more like a tower-house than a gatehouse, and may have been built by a local chieftain, to imitate a strong English castle, with the consequent elevation in power and status that such a building may confer. The building has latrine chutes and marks of wicker centering in the vaults. In the town, at the foot of the main street, stands Newtownstewart Castle (H402858). This is a large Plantation house built Sir Robert Newcomen. It was a three-storey house with crow-stepped gables and it was dismantled by order of James 11 in 1689. Only the S gable remains to full height but there are many other portions of walls. These include a half-round stair in the W wall. During recent excavation and conservation a Bronze Age burial cist was discovered. This contained two large decorated urns with cremations. It is hoped that when conservation work is finished that the Bronze Age finds will be displayed. St Michael's Parish Church, Castlecaulfield was built by the Rev George Walker about 1680. Transepts and a W tower were added later. The S porch dates from 1685. There are a number of interesting windows and several carved heads visible. The sundial on the S face of the tower is dated 1685 and is of the usual design with a fan-shaped arrangement of numbers. The sundial on the W face of the tower has a T-bar gnomon which casts a diagonal shadow. At the edge of the churchyard is the large Burges Family mausoleum which has a tetrastyle Tuscan temple front. It was erected after the death of John Henry Burges of Parkanaur in 1822. To the S of the village is the ruin of Castle Caulfield (H755626) which was built between 1611 and 1619. It was burnt in 1641 but restored and lived in by the Caulfields in the 1660s. St Oliver Plunkett used the courtyard for ordinations in 1670 but it was ruinous by 1767 when Wesley preached there. It is a three-storey L-shaped ruin with a squat gatehouse at the NW corner. This features good murder-holes, a round flanking tower and a Tudor archway. The main castle is well provided with mullioned windows and octagonal stone chimneys. There are sandstone string courses between each floor. The building was originally of half H plan but one wing has been completely removed. There are no defensive features within the main structure.